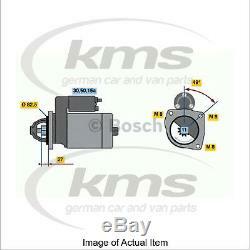 New Genuine BOSCH Starter Motor 0 001 110 004 Top German Quality. Belt Tensioner Wheels & Bkts. Mirror Heads, Housing & Motors. UK Reg No/Vin MUST be supplied. The compatibility is only a guide. A UK Reg or VIN number MUST BE SUPPLIED as in many cases there is a "choice" depending on chassis numbers. We cannot be held responsible if this is not supplied or is supplied after despatch. Rated Voltage [V]: 12 Rated Power [kW]: 1.7 Number of mounting bores: 0 Number of Thread Bores: 3 Number of Teeth: 11 Clamp: 15a Clamp: 50 Clamp: 30 Flange Ø [mm]: 82.5 Rotation Direction: Clockwise rotation Pinion Rest Position [mm]: 23.5 Starter Type: Self-supporting Thread Size: M8 Thread Size 1: M8 Thread Size 2: M8 Length [mm]: 267.5 Position / Degree: rechts ° Connecting Angle [Degree]: 49 Jaw opening angle measurement [Degree]: 130 Fastening hole angle measurement [Degree]: 49. Any of the brands above, equivalent or OE supplier brands may be supplied UNLESS customer specifies. OE Part Number (or Equivalent). Any of the brands above / below, equivalent or OE supplier brands may be supplied UNLESS customer specifies. Our couriers will usually deliver between 7am to 7pm (Monday to Saturday). Estimates can be provided beforehand but prices may differ upon ordering. Such charges are the responsibility of the customer and NOT included in our prices. Prices quoted for International deliveries apply to those areas the Carriers deliver to on a regular basis. If your address falls outside of this the Carrier may charge a "remote area surcharge" that will need to be paid by the customer in order to have the parcel delivered. Should you wish to take the item as is please ensure it is listed as "damaged", "opened" or "tampered" with when you sign for it. Lost/damaged orders Claims for damage or loss in transit must be made in writing within 12 days from date of dispatch. KMS will not be liable for any consequential losses incurred due to any problems with their deliveries, such as late or damaged deliveries. Upon receipt, all products will be inspected and at our discretion, credit may be refused. All damages must be reported to us within 24 hours in order for us to raise any claims with our couriers. Any claims after 24 hours cannot be accepted. If you have any problem with your order, please give us a chance to put it right for you by contacting our Customer Service Team. We always aim to reply to all messages within 24 hours. Help is available Monday to Friday from 8.30am to 5.30pm, and on Saturdays from 8.30am to 1.30pm. The item "New Genuine BOSCH Starter Motor 0 001 110 004 Top German Quality" is in sale since Monday, October 8, 2018. This item is in the category "Vehicle Parts & Accessories\Car Parts\Electrical Components\Starter Motors". The seller is "kmspartsonline" and is located in Birmingham, West Midlands.